Well Girl, you just bask away! :) With all that springing you did, you need to sit back and relax a while. LOL! I'm SO glad you liked the pickles. Thrills me to pieces. :) I love 'em too. Lori, these really are delicious. I made a trial batch last week to see how I liked them. They got two thumbs up, so today I made three more batches. I have a feeling there are more to come :) I made your herb rolls the other night, too. We devoured them. Another new favorite. That is fantastic. I am definately trying this method, I never heard of freezing them. I am excited to try it. How awesome :) I didn't know pickles can be frozen. Great post! Oh these sound so easy to make .. I have got to try them!! Ask your Kahuna how to keep the varmints from dining on all those great veggies before the humans get the chance. Short of building a mini-Alcatraz out of chicken wire I'm at a loss. I love that these go into the freezer instead of all the work of canning! They sound delicious! The Bumbles, I believe the mini Alcatraz with chicken wire is Kahuna's weapon of choice in the battle against the varmints. He also has some battery-operated stakes you stick in the ground; they emit high frequency sounds that drive off the underground critters. But mainly, chicken wire. Lots and lots of chicken wire. Frozen pickles? Never heard of such a thing, but why not. I wish I had a freezer besides the one that's the top half of fridge. That one is filled with ice cream. 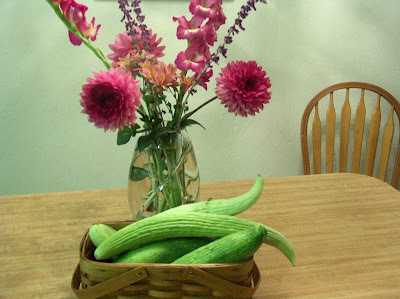 My mom grows those cucumbers too and she always called them Armenian Cucumbers. I just googled a pic and I believe she is right. 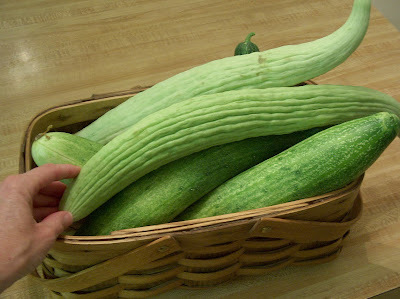 I really like them as they are more crunchy than the regular garden variety cucumber. Your recipe looks delish and I will give it a try! Sorry, I did not mean to be "anonymous" but I was in a hurry (and trying to read your blog at WORK- ah-hem) and just hit the wrong button. 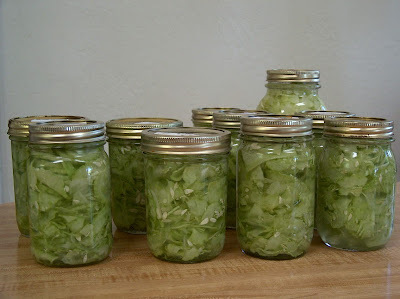 We just love those cukes and make refrigerator pickles with them. I have never tried the freezer way, but I will! 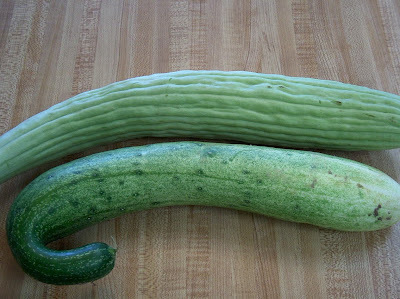 Hi Lisa S. (no longer anonymous :) ), I'm so glad to know that what we are growing are actually Armenian cucumbers (not Japanese cucumbers). And the pictures I saw on-line of lemon cucumbers are actually nothing like the other variety we're growing, so I think I was wrong on both counts :( I will say, the Armenian kind have been delicious, while the other kind -- whatever they are -- have tended to be bitter. So next year we may just stick with the Armenian. And they're so pretty when you slice into them; they look like little flowers. Thanks for passing along the info.